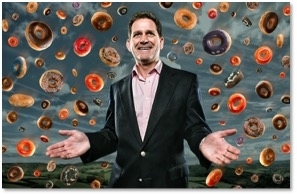 A diet of Donuts guarantees growth for SMEs….in a healthy way. Eighteen months after the Government abandoned its support for small businesses with the closure of the Business Growth Service, Donut, the UK’s most visited business advice website, is launching ‘Money Donut’, providing guidance to SMEs on finance, accounting, tax, insurance and pensions. The launch of Money Donut coincides with a series of Government initiatives, such as pensions auto-enrolment and the upcoming Making Tax Digital changes, both issues on which businesses are crying out for guidance. All six Donut websites are joined up, with more than 20,000 pages of expert advice, guides, checklists, case studies and practical business tools. With half a million unique users every month, the Donut websites are already arguably the most popular source of small business advice in the UK. 2. A selection of other images are available in this dropbox. 3. Rory MccGwire is available for interview. 4. Where does the name ‘Donut’ come from? The answer is here: Why call it Donut? 5. The Donut websites are: Money Donut, Start Up Donut, Marketing Donut, Law Donut, Tech Donut, and Sectors Donut. Advice, resources and tools for starting a small business. Information on getting finance, business planning, hiring, IT, marketing and much more. © Copyright 2019. Atom Content Marketing.